Sleeping on the ground is never going to be as comfortable as your mattress at home, but campers are usually happy to put up with that. Not always – any big campsite will have a fair selection of camp cots and airbeds on display – but for backpackers, those are much too heavy and bulky to be serious options. Some sort of protection from the ground is essential, though – not so much for comfort, but for insulation. When you’re lying down the bottom of your sleeping bag will be compressed by your weight, and loses a lot of its insulation. Even on a summer night enough of your body heat will be conducted away by the ground to make you pretty uncomfortable. Even if you do have a camp cot the cold air beneath its thin nylon top will rob you of precious heat, especially in winter. That makes some kind of sleeping pad an extremely useful piece of kit to take with you. Airbeds are a viable option if you’re camping with a vehicle or RV, but they can be heavy and they’re also time-consuming to inflate without a pump; that makes them unsuitable for backpackers. For a long time, the only alternative was a closed-cell foam sleeping pad. These are bulky but light; they can be easily rolled up and fastened to the side of a pack. They’re also fairly robust – but they will start to get gouged, or even lose chunks if they get caught on thorns or barbed wire. A more modern alternative is a self-inflating pad. These are made of open-cell foam, inside an airtight cover that’s usually made of textured nylon like Cordura; this is fitted with a valve. These pads can be folded and rolled up into a reasonably compact size, and usually, come with a small stuff sack. Remove it from the sack and open the valve, and the springiness of the foam filling will automatically inflate it to create a pad that’s much thicker than a closed-cell one and gives both better insulation and more comfort. With the valve closed the air won’t be forced out when you lie on it, either – but open it again and you can pack the pad away in the morning. These are a lot more expensive than a simple foam pad, but a lot better to sleep on. They’re also much easier to pack away if you’re traveling by plane or coach at any point in your trip. On the other hand, they can occasionally be punctured by sharp stones or sticks, so make sure you clear the ground before unrolling it. Once punctured they still give some insulation, but nowhere near as much. This is a classic foam sleeping pad with a couple of nice touches. The main feature is that the surface of the foam has a molded texture. If you’ve used foam pads before you’ll know that sleeping bags tend to slip around on the smooth surface, so you can find yourself sliding off it during the night onto the ground. The dimpled surface of the ALPS makes that a lot less likely. It does make it slightly harder to keep clean, but when you get back from your trip a quick scrub with a soft brush or a blast with a hose, will get rid of any dirt. The pad itself is water-resistant and quite tough. The ALPS is available in various sizes and thicknesses. For maximum insulation, and slightly more comfort, pick one with the model number 750; these are thicker than the 625 models or the very thin 375. The 375 might appeal if you’re looking at ultra-lightweight backpacking, but the foam is so light anyway that the difference won’t amount to more than a few ounces. The Large mat is 25 inches wide and 77 long, which should be plenty for most people. If you really want to save weight (or bulk) go for a smaller, rather than thinner, pad. You can even cut it down shorter because it’s your upper body that really needs the insulation. Not all foam pads are equal quality, but this one seems to be made of good, dense foam. That makes it a lot tougher than some we’ve seen, so it should last a few years of regular camping trips. The ALPS mat comes with two stretch bands for securing it once it’s rolled up, and it can easily be fastened to your pack with straps or a shock cord. An affordable, good quality foam pad with a wide range of size options. Thicker versions are reasonably comfortable and give great insulation. Excellent value. They are available for less than $25 here. Therm-A-Rest developed the first self-inflating mattresses in the late 1980s and still make some of the leading models. The Trail Lite is an outstanding choice for lightweight backpacking; it’s designed to give the best possible combination of compact size, lightweight, and comfort. It’s twice the price of the ALPS, at around $70 here, but offers a lot more performance as well. The core of the Trail Lite is die-cut from open cell foam, with profiled surfaces to reduce weight and avoid slippage during the night. It’s not a plain rectangular shape either; more weight has been saved by leaving the upper section straight to maximize sleeping area but tapering the lower end. The result is a pad that, rolled up and stowed away in its stuff sack, packs down to about a foot long and seven inches in diameter. When unpacked and inflated it expands to an inch and a half thick – twice as much as the ALPS pad. That gives excellent insulation, as well as a lot more comfortable than you’ll ever get from closed cell foam. The Trail Lite is heavier than a foam pad at about three pounds, but still easily manageable, and its size makes it easy to pack away in a rucksack. The tapered shape means it’s also perfect for use in a hammock. Compact, sturdy and very warm, this is a great pad for lightweight campers. Comfort is very good, especially insulation. Check out this listing for the latest pricing. Lighter mats work well in most climates, but for winter camping they can still let a lot of heat escape. 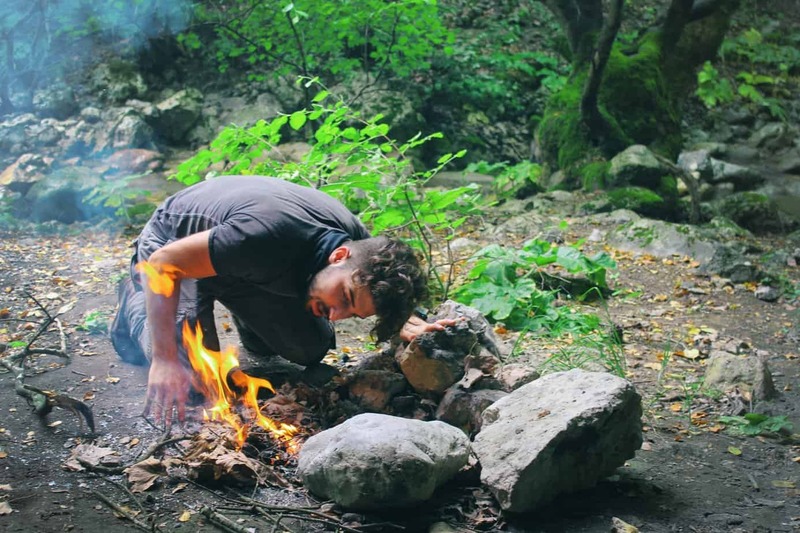 If you’re looking at backpacking when the temperature falls towards zero you’ll need a good sleeping bag if you’re going to be able to get any rest – and you’re going to need a really high-performance mat to go with it. The Exped DownMat 9 is built for exactly this sort of expedition. At first glance, the DownMat 9 resembles a conventional air mattress – the welded baffles in its airtight shell form a series of tubes. The difference is that they’re filled with IDFL-certified goose down. This is an excellent insulator and it also makes the pad partly self-inflating; the natural loft of the down will expand it as soon as it’s unrolled and the valve is opened. If you’re in a real hurry you can use it like that – but we wouldn’t recommend that. The real trick of the DownMat is the built-in hand pump, which will fully inflate it in a couple of minutes. Fully inflated this pad is over five inches thick and the insulation it provides is unbeatable. Even on the coldest ground, you won’t lose any heat through the down-filled chambers. 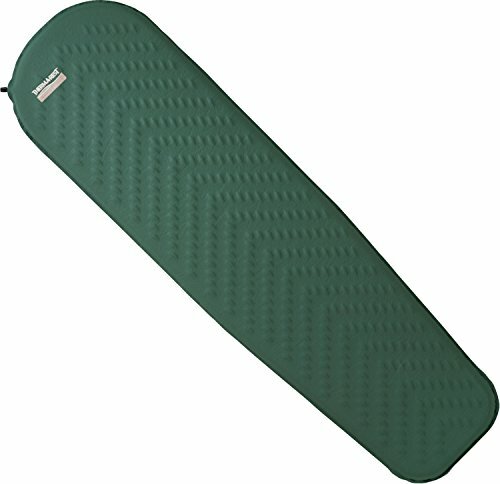 It’s also the most comfortable sleeping pad we’ve found, again thanks to its thickness. It still packs down very small and weighs just a touch over three pounds – not much more than the Therm-A-Rest. As you can guess it’s also the most expensive we reviewed at around $200, but if you’re looking at a winter backpacking trip it’s well worth it. A top of the line camping mattress; overkill for most trips unless you really value your comfort, but worth every cent when there’s snow on the ground. Right now, it’s on sale here for just over $180.